A composite photo of four images taken by the Rosetta orbiter about 19 miles (31 kilometers) from the center of Comet 67P/Churyumov-Gerasimenko. Last November, the European Space Agency's (ESA) washing-machine-size Philae lander detached from its orbiting Rosetta mothership and came to rest on the surface of Comet 67P/Churyumov-Gerasimenko after a harrowing and dramatic double-bounce touchdown. Comet 67P will make its closest pass to the sun next Thursday (Aug. 13), with Philae still along for the ride, and ESA and the online Slooh Community Observatory will mark the event with a webcast that begins at 1 a.m. EDT (0500 GMT) Saturday (Aug. 8). You can watch the show directly from Slooh at the observatory's website: www.slooh.com. You can also follow along live here at Space.com, courtesy of Slooh. During the show, Slooh host Will Gater will discuss the history-making Rosetta mission with its project scientist, Matt Taylor. The webcast will feature live shots of Comet 67P from ESA's Optical Ground Station telescope on Mount Teide at the Institute of Astrophysics of the Canary Islands. "This specialized telescope is one of ESA's largest, and represents a unique opportunity for the public to see through a world-class telescope," Slooh representatives said in a statement. 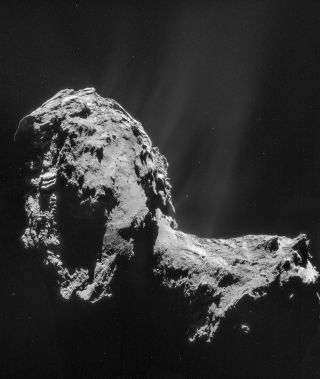 The Rosetta mission launched in 2004, then took a circuitous route to rendezvous with 67P. The spacecraft arrived in orbit around the comet in August 2014, then, three months later, released Philae for its epic landing. The Rosetta orbiter continues to study Comet 67P from orbit with 11 instruments, documenting how the object is changing during its close solar approach. Philae gathered a variety of data on the surface with its 10 instruments until its primary battery died, about 2.5 days after touchdown. The original plan called for Philae to come to rest in a spot that would allow it to keep operating with its secondary battery, which is recharged by solar power. But the double-bounce touchdown deposited Philae in an unexpectedly shady spot, so it went into hibernation when the primary battery died. Philae woke up in June thanks to increasing levels of solar radiation, but mission team members have so far not been able to establish a secure and stable communications link with the 220-lb. (100 kilograms) probe.